This 1835 letter was printed in The Mechanics’ Magazine, Museum, Register, Journal, and Gazette, Volume 23. In the letter, the author, J. Elliott, writes about a method for preserving milk. He refers to a newspaper article from 1822 (published in 1821, it turns out, then reprinted several times) which cites a detailed method for preserving milk, as well as mentioning a new patent for another method. The method will sound familiar: bottling the milk, sealing it, heating it to a boil, then cooling it. Pasteurization right? Only Pasteur was born in December 1822, which means he couldn’t be the inventor of the process for which he is known, could he? I had to continue my silver research, but I resolved to come back to this topic and figure out who actually invented pasteurization. 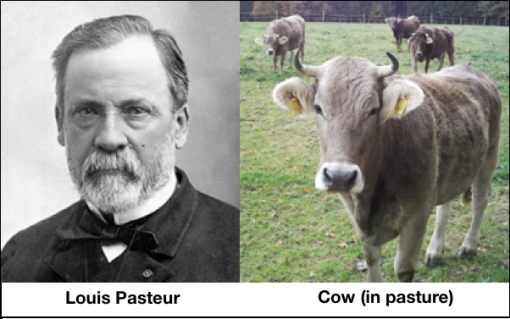 Before we start digging into that question, let’s talk about the process Louis Pasteur is so famous for, how it works, and then we’ll get into how it came to be known by his name. Have you ever been to a coffee station and found creamers that said “no refrigeration needed” but that claimed to be cream from a cow? Yet, you buy a gallon of milk from the store and two weeks later it has a horrific smell despite being refrigerated? These items have both been pasteurized—which is to say that they’ve been heated then cooled to kill off bacteria. It turns out that there are several kinds of pasteurization. The kind used in the US for cold-stored milk is usually High Temperature Short Time (HTST) pasteurization. It is effective in killing off 99.999% of dangerous bacteria. That isn’t 100% and over time, even in refrigeration, the milk will go bad. There are also Ultra High Temperature (UHT), Extended Shelf Life (ESL), Microwave Volumetric Heating (MVH), Vat processing and probably even other methods and acronyms. While reading about pasteurization methods, I came across a lot of discussion about the alleged merits of “raw milk,” which is milk that has not been pasteurized. It surprised me how vociferously some people are promoting the consumption of raw milk—and the rejection of pasteurization as somehow bad because it allegedly destroys some of the healthy vitamins. While I can link to research papers that quantify heat’s impact on nutrition, I think it is more important to remind readers of something that I think is underappreciated in discussions of whether to pasteurize or not: Unpasteurized milk is a disease vector for tuberculosis and other life-threatening diseases. Yes, before pasteurization became widespread, drinking milk was a common way to catch TB. Until I started researching this topic, I assumed pasteurization was just a way to keep milk on the shelf longer so it could reach my home safely and become a part of a healthy breakfast. I’m not a public relations expert, but I think this should be a more prominent part of some public awareness campaign? This isn’t some kind of “gone with the 1800s” thing either. Raw milk related TB deaths are happening now—in the 21st century—both in America and in Europe. Louis Pasteur and a cow (in a pasture). Image Rights Info Below. Let’s get back to Pasteur. You may remember the story of how in the 1860s he performed an experiment involving broth and flasks. He heated the broth in two flasks—one with an S-curve to keep out bacteria and one with a straight neck. He let the flasks cool and the broth in the S-curve stayed fresh while the broth exposed to the air “went bad” as airborne bacteria began to grow in it. Later, he broke off the S-curve and allowed air to enter the “clean” broth. It, too, began to grow bacteria. 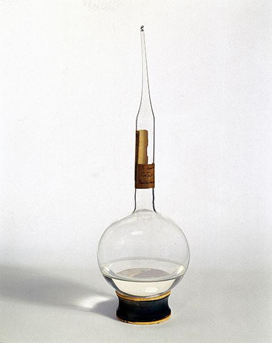 Glass flask used by Pasteur, 1860s. If this one was an S-necked flask, that has been broken off. Image Rights Info Below. It’s a compelling experiment. It is commonly used in classrooms to talk about how Pasteur proved the germ theory of medicine. Read just a few excerpts from Pasteur and you’ll see that his work had a huge impact on the public recognition that many diseases come from bacteria. Pasteur was using the Scientific Method to evaluate germ theory. By the end of his career, he was finding very specific pathogens and identifying the methods of their spread and infection. His work definitively confirmed that many diseases are caused by bacterial agents, and that sanitation was important (especially in medicine) to stop their spread. But back to that flask experiment. Before Pasteur conducted his broth experiments other scientists had also used the same experiments to argue over the popular theories of spontaneous generation and preformationism. Spontaneous generation is the idea that life could spring from nothing into existence, often exemplified by the idea that maggots come from spoiled meat. Preformationism is the idea that grown life comes from tiny versions of the animal adult. It may sound absurd to modern readers, but these theories were subjects of very serious scientific inquiry and their exploration, and the scientific implications of the outcome of such work, had enormous impact on the development of our modern medical practices. Before Pasteur’s 1862 broth experiment confirmed spontaneous generation to be an invalid hypothesis, the same experiment was used to “prove” its validity by John Needham (1713–1781). In 1745 Needham, a scientist and clergyman (and another microscope enthusiast), proposed an experiment to settle the question of spontaneous generation. He made broth in flasks, boiled them and sealed them. Soon microscopic life formed and Needham proclaimed that this demonstrated life is spontaneously created. The matter wasn’t settled though. In 1768, Italian scientist Lazzaro Spallanzani decided to revisit Needham’s experiment. He realized there were flaws in the original experiment. Needham hadn’t sufficiently heated the broth to kill all the bacteria. So Spallanzani re-created the broth experiment, only he boiled the broth long enough to actually sterilize it. His sealed broth stayed bacteria free as long as the container wasn’t opened. When it was unsealed, within a short time the bacteria returned and Spallanzani surmised that there are infectious agents floating in the air. Nearly a century passed between Spallanzani’s experiment and Pasteur’s. People knew that heating was somehow involved in killing bacteria. Well, a few people did. Keep in mind that the Internet was very primitive in the 1700s and cell phones were still huge bricks that people had to throw through windows in order to make a call. Ideas took longer to spread. Pasteurization wasn’t just a way to delay the spoilage of broth, of course. It had huge implications for the shelf life of something far more important to most western society: beer and wine. Much of Pasteur’s work in food preservation was in these industries. For example, Pasteur conclusively demonstrated that fermentation was caused by yeast in an 1857 scientific paper. In many ways the late 1800s were a heady time for the beer and wine industries—but they had a problem. Sometimes their products would mysteriously turn sour. Pasteur solved part of the problem by introducing his heating/cooling process.. This had a huge impact on the shelf life because it prevented further growth of yeast (or other unwanted life forms) in the bottles. A second advancement came through Dr Emil Hansen (1842–1909). Hansen discovered that part of the problem was that only some strains of yeast made good beer. He developed a way to identify, separate and clone the good yeast. Hansen’s yeast strains were shared worldwide and are still used today. According to Carlsberg brewery, it was Pasteur’s endorsement of Hansen’s research that led to their wide adoption of the cloned yeast in the 1880s. As an aside, it is probably worth researching in another article the impact that beer preservation had on other technologies. Adolphus Busch was the first American to use pasteurization on his beer, in the 1870s. He also influenced the development of mechanical refrigeration, and the development of refrigerated train cars for shipping nationally. The whole history of mechanical refrigeration and heating is a fascinating chain of discoveries that I’ll have to come back to later. Of course, pasteurization is used in preserving other foods. Ever wonder why you can safely leave an unopened mayonnaise jar on the warm pantry shelf for months? Pasteurization. If it says “refrigerate after opening,” there is a good chance you’re dealing with a product that has been pasteurized: ketchup, mustard, juice, beer, wine, and cans of food. Speaking of cans, did you know the first can opener patented in the US (1858) was invented by Ezra Warner of Waterbury, Connecticut? (Salute!) Priority for the can opener goes to Robert Yates of England in 1855, but both men seem to have developed their inventions separately. Wait… 1855? That’s strange? I mean strange if you consider that placing food in cans and then heating and cooling them for preservation was invented in almost fifty years before the can opener, way back in 1810, a process patented by Peter Durand of England. Until the can opener was invented, the recommended way of opening a can was a hammer and chisel. As odd as it may seem, the advanced durability of preserved canned food over glass-bottle storage outweighed the inconvenience of having to assault the armored food with steel weaponry before each meal. As you might imagine, the easy-to-operate, reliable food preservation jars invented by John Landis Mason in 1858 were wildly popular for the home food-preservationist. I still find it surprising that the overall process of pasteurizing food this way is generally known as canning, despite most practitioners using jars, but canning it is. The father of tin cans, Peter Durand, was advancing the work of French food preservationist Nicolas Appert (1749–1841). Appert had worked on the problem of food preservation for more than 15 years before writing a book on the process and winning a prize from the Napoleonic government. Appert’s method will sound familiar to you by now—he placed the food in a bottle, sealed it, heated it for a period of time then cooled it. But Durand’s fame is tied to his patent, and history suggests that it was French inventor Philippe De Girard (1775–1845) who actually developed and first demonstrated the tinned can as a food storage device. Durand sold his British canning patent after a couple of years and it was the buyers who actually setup the first commercial cannery. The success of their commercial cannery was instrumental in the spread the adoption of this new food storage practice. A few years later, Durand would also get a canning patent in the US. Contracts with the British navy also helped ensure canning’s success. Consider this: Despite the fact that Appert had figured out a way to preserve food, he was not using a scientific methodology and he didn’t know why it worked. Early adopters of the canning process made many big mistakes such as not heating the food long enough (which would allow the bacteria to grow in the can leading to ruptured cans in the best case, or sick or dead consumers in the worst) and they sometimes used unsafe lead solder to seal the cans, which famously contributed to Franklin’s lost expedition to find the Northwest Passage. What Pasteur did was to apply scientific rigor and the advances in technology (microscopy, biology, carefully documented repeatable steps, etc.) to the problem. He didn’t just figure out why the heating works, but precisely what temperatures, what lifeforms are being killed, and which bacteria are causing specific diseases. Very important work. He did not invent the process, but he quantified it and perfected it. And I feel I would be remiss in trying to tell the story of pasteurization if i didn’t mention the sad tale of Ignaz Semmelweis (1818–1865). In the 1840s Dr. Semmelweis promoted the idea of having doctors wash their hands before attending childbirth. The short version of his story is that he was trying to prevent childbed fever, a disease that tended to kill new mothers with alarming frequency. When he implemented his hand washing regimens at his hospital, deaths from this fever dropped to almost nothing. There were cultural and political groups in his contemporary medical society who did not care for his teaching (or, perhaps for Dr. Semmelweis himself?) and ultimately his hand-washing protocols were rejected. He lost his job and eventually ended up in a mental institution where he was beaten to death by his guards after just a couple of weeks. Two years later the research of Dr. Joseph Lister would vindicate Semmelweis’s ideas, and it is Lister who becomes immortalized by the general public via the antiseptic mouthwash Listerine and the disease Listeria being named after him. Semmelweis’s story is frustrating in that the data supported his conclusions, but the culture couldn’t see past their biases. The history of who invented pasteurization is not simple. While a straight line can be drawn showing the dates of various discoveries and events, it was a meandering process to get to a functional germ theory of disease. Pasteur’s meticulous experiments and conclusions are indeed laudable, but his work represents further hard-won progress towards a better understanding of how things work, not the solitary accomplishment of a single determined man. This is not a unique story in the history of invention and discovery. There is a disconnect between how we are taught history (as a series of names, dates and an accomplishment) that fails to adequately explain the extraordinary interconnectedness necessary to push the boundaries of human accomplishment forward. Even that perception that we are on some inevitable timeline that starts with the Flintstones’ stone-wheeled car and ends with Star Trek spaceships is, perhaps, somewhat flawed. Invention is an accretive process. The automobile couldn’t exist without all the structural, mechanical and chemical engineering accomplishments that are prerequisites. The digital computer required many mechanical and mathematical discoveries before it could become a reality. And time and time again the claims of primacy of an inventor will be questioned by others who say they’ve made the same devices. Were they spying? Copying? Or are certain synergies of discovery destined to culminate in nearly simultaneous invention? We’ll get to those questions in future posts.